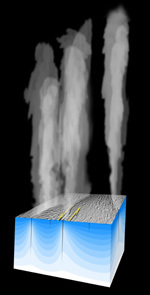 Plumes of water vapor and other gases escape at high velocity from the surface of Enceladus, as shown in this artist concept. Credit: NASA/JPL. Francis Nimmo, assistant professor of Earth and planetary sciences at the University of California, Santa Cruz, and his coauthors calculated the amount of heat that could be generated by this mechanism and concluded that it is the most likely explanation for the plumes and other features observed in the south polar region of Enceladus. This region is warmer than the rest of the frozen surface of Enceladus and has features called "tiger stripes" that look like tectonic fault lines. Unlike some other proposals for the origin of the plumes, this mechanism does not require the presence of liquid water near the surface of Enceladus, noted coauthor Robert Pappalardo of NASA's Jet Propulsion Laboratory in Pasadena. "The heat is sufficient to cause ice to sublimate, like in a comet--the ice evaporates into vapor, and the escaping vapor drags particles off into space," Pappalardo said. The frictional or "shear heating" mechanism is consistent with an earlier study by Nimmo and Pappalardo, in which they proposed that Enceladus reoriented itself to position the hot spot at the south pole (see earlier press release). In that study, the researchers described how the reorientation of Enceladus would result from a lower density of the thick ice shell in this region. In addition to Nimmo and Pappalardo, the coauthors of the paper include John Spencer of the Southwest Research Institute in Boulder, Colorado, and McCall Mullen of the University of Colorado, Boulder. This study was funded by NASA's Planetary Geology and Geophysics and Outer Planets research programs. Enceladus has sparked great interest among scientists, particularly since the discovery more than a year ago by NASA's Cassini spacecraft of the geysers shooting off its surface. This is one of two papers about Enceladus appearing in the May 17 issue of Nature. In the other paper, scientists explain how cracks in the icy surface of Enceladus open and close under Saturn's pull. Saturn's tides could control the timing of the geysers' eruptions, researchers suggest. The Cassini-Huygens mission is a cooperative project of NASA, the European Space Agency, and the Italian Space Agency. More information on the Cassini mission is available online from NASA and JPL. Note to reporters: You may contact Nimmo at (831) 459-1783 or fnimmo@es.ucsc.edu and Pappalardo at (818) 354-5837.